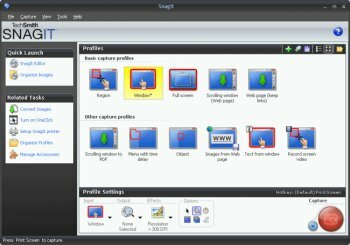 SnagIt delivers customized screen captures with the press of a hotkey. SnagIt is the only screen capture software that captures images, text, and video from your Windows desktop. Effortlessly produce perfect graphics and video with this complete capture solution. works good for IE only! I previously used SnagIt all the time; it has a lot of interesting features, but after a while I turned away from it because I wasn't using all the functions. I found free alternatives that did 90% of what SnagIt did. I don't see the justification for the $50 purchase. I still rate this highly for it's abilities, but if all you're doing is still screenshots; there's other options. Still has a few bugs to solve. to Blaxima: FastStone Capture is very nice. Needed more MODES - 3 or 4. From Simple to PRO. For the price, it's not worth it. If it were a free option I'd give it a 3. I make little use of screen capturing and there are many free options including paint that can handle this function with your print screen button so what I was mainly looking for was video capture. I've tried everything from Camtasia (buggy crap), Screen2AVI(good video but only records the mic line), Ashampoo(bloated crap) and on and on. Most were just to cluncky and I always seemed to have playback issues(choppy or out of sync video). Reducing the FPS never really helped either. I like slim apps, what do one thing best. Here we see that Snag version 9/10/11 gets some features not much useful - like partial editing of image. * and Camtasia 7.1.1 of course. This new version 10 is absolutely awesome! It has new features such as the All-in-one-capture and the ability to capture transparency which makes this edition a game changer for TechSmith. Snagit is not just a screen capture tool but a screen capture editing suite. Video capture is a snap and saves to .avi. Give it a try if you never used it before and upgrade from the older version as this one is worth every penny. Eh? What does witnessing awful performance have to do with recognizing the value of advanced features? Nothing, that's what. I have terrible performance with SnagIt 9.x as well. My system is old, yes. SnagIt 8.2.3 runs great on it. Oh--and I use text capture, region and window screen shot capture, and video capture. I hope that's OK. I use this everyday and it provides an amazing wealth of functionality. The prior reviewers below probably only use it to capture basic screenshots once in a while, and don't realize the added value that the new UI and functionality provides to real power-users that need this in day to day work. There is not a feature or change that I do not use and celebrate. I use this tool at work on a 2.2Ghz dual-core laptop and the performance is fine. If you just want a simple snapshot tool, then you might consider this bloated, but if you want the the Swiss Army Knife of snapshot software, look no further. Some of the enhanced features, such as the image editor, image format conversion, stamps, etc are a nice touch. Maybe not best of breed, but much better than nothing (which is what I would have if I had to justify the purchase of these features to my IS dept). I'm sure many of you know what I mean. So I rate this 5-stars for ease of use, performance, stability and the fact that I really need and use this tool every day and am quite satisified with it. SnagIt was among the very best in this genre. However, I completely despise the skin garbage they've added to it. It's ugly (a subjective point), but also much slower (objective). And it's completely unnecessary (objective). I updated (note that I do not say "upgraded") from version 8. What I immediately noticed was not improved features, but having to deal with annoying GUI changes, and incredibly ssssssssssssslow program operation. So in summary, they took a nice program, made needless GUI changes to make idiots happy, made it work very, verrrrrry slowly, and charged an update fee. Fortunately, TechSmith is good at providing refunds. So much for buying updates sight unseen! I use this program daily in my job for creating documentation. I can take 50 or more screenshots a day. It not only does a great job capturing windows, regions, scrolling web pages, and text, but its annotation tools (callouts, stamps, etc.) are top notch. A must-have tool if you do help files for a living. What 247 said. What was once a great little utility has outgrown any sense at all. And $50? They're only kidding themselves. A once great tool (v8) that has been "upgraded" and "upgraded" until it was a big messy, worthless, pile of dogsh1t. Slightly become bloatware, what is the problem with all these programs searching your whole f*cking system for crap. Keep at what it's designed for, taking snapshots and nifty editing options. Leave the searching alone, we can do that too !